If a post has more than (comment_per_page) comments, we should query them specifically, not query all the comments and sort in PHP (doesn't scale well). else query (comments_per_page) parent comments, and keep doing queries for their children, up to the threading limit (10). 8071.diff​ (6.4 KB) - added by wonderboymusic 4 years ago. 8071.2.diff​ (3.6 KB) - added by wonderboymusic 4 years ago. 8071.3.diff​ (8.1 KB) - added by wonderboymusic 4 years ago. 8071.4.diff​ (7.9 KB) - added by wonderboymusic 4 years ago. 8071.5.diff​ (8.3 KB) - added by boonebgorges 4 years ago. 8071.6.diff​ (28.0 KB) - added by boonebgorges 4 years ago. 8071.7.diff​ (8.5 KB) - added by boonebgorges 4 years ago. 8071.8.diff​ (30.3 KB) - added by boonebgorges 4 years ago. Still think this is worth testing, to see how much of a performance benefit it yields. Closing as wontfix. As much as I agree this should really be dealt with in SQL, I dug into this one myself recently while redoing my theme's comments template. Basically, the paging is so in WP that you the walker class grabs all of the comments. You then extract the correct ones based on filters (by type, etc.) and number of comments per page. As the stuff in there can use custom callbacks, there's absolutely no way this can land in SQL. That's not exactly true. The separation is done in wp_list_comments() and only after that it's sent to Walker_Comments. So, I think it can be moved into SQL, when threading is disabled. It will require some non-trivial refactoring, but it is doable. Add a new orderby value in WP_Comment_Query: comment__in - when querying by comment__in, need to return them in the same order. #28410 was marked as a duplicate. 8071.2.diff​ are the remaining bits after r34205 and r34212​. 8071.3.diff​ scales a post that has 100,371 approved comments / 400,000 total comments bound to the post ID. Without the patch, the page doesn't even load, even when paginated. If your comments are already paginated, and you have an extraordinary # of comments, these queries now scale. If you are not paginating comments, and all of a sudden, you get 100,000 comments, and you're not using an object cache, your page will now load. In WP_Comment_Query, mimic the ->found_rows implementation of WP_Query by using SQL_CALC_FOUND_ROWS and adding a ->set_found_comments() method and ->max_num_pages prop. This allows us to paginate our queries, rather than paginating in Walker after querying every single comment. After getting all of the comment IDs via the passed query args, query all of the relevant objects at once via IN and then order the results via comment__in, ditching the extra sorting values. This is now possible via . Current plan is to move much of the guts of 8073.3.diff to WP_Comment_Query, where it'll benefit all those who venture into WordPress comments, not just those using comments_template(). 8071.5.diff​ is the first step in generalizing wonderboymusic's patches - it splits the query in WP_Comment_Query. In the process, it normalizes the way that single comments are cached to reduce cache misses in certain cases. Posting here for comment (LOLZ) before I move on to the next stage. complete cache coverage for normal comment queries. Docs: Add a description for the documented use of the $wpdb global in _prime_comment_caches(). 8071.6.diff​ takes the spirit of wonderboymusic's patch and moves it deeper into the API. By moving some of the threading+pagination logic into WP_Comment_Query rather than comments_template(), we open up the performance improvements to other developers. In order to maintain some separation of powers in WP_Comment_Query, I had to stash the SQL clauses in an object property. That's why you see all the red/green there. I'm defaulting no_found_rows to true. This is in keeping with current behavior. SQL_CALC_FOUND_ROWS can be very expensive, and I don't want to wreak havoc with people using WP_Comment_Query for weird things. To support the tree display, I added some children infrastructure to WP_Comment (add_child(), get_child(), get_children()). None of this threaded/tree stuff is used in core - we use a walker instead - but it seemed to round out the API. With this patch, the 'page_comments' setting becomes pretty meaningless - we stomp on it whenever we pass a certain threshold. I think it's a good idea to stomp on it, but it makes the UI setting "Break comments into pages..." fairly awkward. At some point - now or in the future - we should remove the checkbox, leaving only the 'comments_per_page' setting. This ticket was mentioned in ​Slack in #buddypress by boone. ​View the logs. Thinking more about recent patches, I'm going to remove the filter on the SELECT FOUND_ROWS() query altogether. SELECT FOUND_ROWS() itself is not costly - it's SQL_CALC_FOUND_ROWS that introduces overhead. For the time being, if a dev doesn't like the way WP gets a total comment count, it can be disabled with 'no_count_rows=true'. Alternative methods for counting (SELECT COUNT(*) WHERE...) can be achieved independently. Improve pagination internals in WP_Comment_Query. Introduce hierarchical query support to WP_Comment_Query. false - Default value, and equivalent to current behavior. No descendants are fetched for matched comments. 'flat' - WP_Comment_Query will fetch the descendant tree for each comment matched by the query paramaters, and append them to the flat array of comments returned. Use this when you have a separate routine for constructing the tree - for example, when passing a list of comments to a Walker object. 'threaded' - WP_Comment_Query will fetch the descendant tree for each comment, and return it in a tree structure located in the children property of the WP_Comment objects. WP_Comment now has a few utility methods for fetching the descendant tree (get_children()), fetching a single direct descendant comment (get_child()), and adding anothing WP_Comment object as a direct descendant (add_child()). Note that add_child() only modifies the comment object - it does not touch the database. Remove debug cruft, introduced in . Hierarchical comment query tests should be order-agnostic. Travis-CI and other test environments can create weird race conditions. 8071.7.diff​ is what remains to fix this issue. I don't think this makes a lot of sense, but I also don't know what would break if we changed the behavior. It's very likely that someone out there is building custom pagination links, and is expecting the behavior described above. In order to introduce pagination that respects the new pagination powers of WP_Comment_Query - which are the key to making comment pagination scale - without breaking backward compatibility for comment pagination URLs, I've put a couple of pretty awful hacks into comment_template(). The hacks would be slightly less ugly if I put them into the Walker or into wp_list_comments(), but both of these could have unexpected consequences, because of the various ways they're used. By isolating everything inside of the already hideous comments_template(), I've greatly limited the possibility of collateral damage. Primary problem at this point: I discovered that wonderboymusic's technique for forcing 'page_comments' is incomplete. When pretty permalinks are enabled, redirect_canonical() will check to see if get_option( 'page_comments' ) is enabled. If not, it disregards 'comment-page-x' URL chunks, so that comment pagination links get redirected back to the post itself. No query has taken place at this point, so there's no way we can force the threshold for pagination based on comment count. In 8071.7.diff​, I removed the get_option( 'page_comments' ) check from redirect_canonical(). But, as I mentioned above, this effectively neuters the 'page_comments' settings. It may be time to kill the setting. Force comment pagination on single posts. root issue: that loading a post causes all of its comments to be loaded too. Comment pagination is now forced. Setting 'page_comments' to false leads to evil things when you have many comments. If you want to avoid pagination, set 'comments_per_page' to something high. The 'page_comments' setting has been expunged from options-discussion.php, and from places in the codebase where it was referenced. For plugins relying on 'page_comments', we now force the value to true with a pre_option filter. comments_template() now queries for an appropriately small number of comments. Usually, this means the comments_per_page value. To preserve the current (odd) behavior for comment pagination links, some unholy hacks have been inserted into comments_template(). The ugliness is insulated in this function for backward compatibility and to minimize collateral damage. A side-effect is that, for certain settings of 'default_comments_page', up to 2x the value of comments_per_page might be fetched at a time. In support of these changes, a $format parameter has been added to WP_Comment::get_children(). This param allows you to request a flattened array of comment children, suitable for feeding into Walker_Comment. WP_Query loops are now informed about total available comment counts and comment pages by the WP_Comment_Query (found_comments, max_num_pages), instead of by Walker_Comment. After , remove 'page_comments' from database. Don't set as part of initial schema. Delete as part of the $unusedoptions routine. Comments: in WP_Comment::get_children(), accept an array so that the values for format, status, hierarchical, and orderby can be passed, instead of just format. The defaults for get_comments() include status = 'all' and orderby = '' - which is no bueno. For threaded comments, we need comments to be retrieved within bounds, so logged-out users don't see unmoderated comments on the front end, etc. Use correct property name when setting child comments. This fixes a typo from , uncovered by unrelated changes in . WP_Comment::get_children() test should be order-agnostic. Either this broke comment links (see #34050) or it's a bug on dotorg. r34561 has broken the order of comments. The comment_order option is having the opposite of its intended effect. Actually it might not have been r34561, but one of the recent changes to comment behaviour. Are you able to give more precise instructions on how to reproduce? There are a number of discussion settings that interact in weird (and awful) ways. What are your values for 'comment_order' and 'default_comments_page'? As far as I know, I've not altered any discussion settings from the defaults. This is on a vanilla trunk install. comment_order is asc. default_comments_page is newest. This is reproducible on a brand new, fresh as daisies, vanilla install. 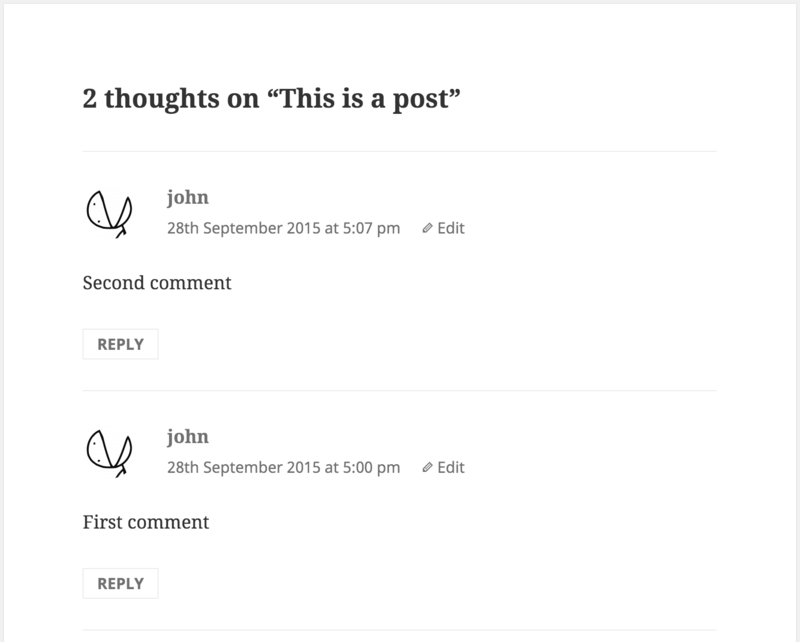 Install WordPress, then leave two comments on the default post (you'll need to moderate the first comment). Thanks for the additional details. This has to do with the legacy logic in comments_template() that separated the logic for multiple-page-threads from single-page-threads. It's no longer relevant, so I'm going to remove it. Some unit tests and a fix coming up. Fix comment_order for single page comment threads. This change ensures that 'comment_order' is respected in all scenarios. Fix logical errors in some comment pagination tests. Comments were not always created in the expected order, due to the incorrect use of 'comment_date_gmt'. 'asc'/'desc' and 'older'/'newer' were confused. 'default_comments_page=newest' ('last') didn't properly account for the cpage=1 offset. This was my doing when I helped write comment paging back in the day and it was done this way so that comment permalinks are actually permanent. That's backwards. Page 1 is always the oldest comments, page 2 are slightly newer comments, and so forth. It needs to be this way otherwise as new comments were added, older comments would be bumped off of one page number and onto the next, rendering permalinks useless. What page a comment is on shouldn't ever change regardless of new comments or what page is displayed by default. The only exception to this is if you change the number of comments per page. Only way to avoid that is to have true comment permalinks instead of just page numbers with anchor tags. it was done this way so that comment permalinks are actually permanent. Simplify pagination logic in comments_template(). (which expects comment pages to be filled oldest-first) were no longer correct. between pages, making their permalinks non-permanent. Prevent extra db queries in WP_Comment::get_children(). now sets a populated_children flag on all located WP_Comment objects. A lot of sites will currently (by choice) be displaying all comments on the page with the page_comments checkbox unchecked. Some of them may even be using themes which don't support paged comments because they have no need for this. Will this change result in those sites 'breaking' until the comments per page setting is manually changed to a huge number? If so, should the WP update automatically change this to a 'huge number' if the checkbox was unchecked to prevent this? @smerriman - Thanks for your comment. I don't have a lot of sympathy for themes that don't have comment pagination built in - this should be a basic feature of any them. But I am sympathetic to sites that will suddenly have the behavior of their sites changed in a radical way. And thinking it over, I see that comment permalinks will be affected fairly broadly by this change, since comment-page-x is part of comment permalinks, and forcing pagination is going to move some comments to secondary pages. One of the pillars of this ticket is that we must force pagination at some point. Originally, wonderboymusic had suggested that we set a threshold higher than comments_per_page. In working on the patch, I decided that forced pagination made the 'page_comments' setting pointless, so I pulled it out. But in retrospect, the problems described above suggest that we should be much more delicate about forcing pagination. I think I'd like to reintroduce page_comments, and continue to respect it, until we get to a fairly high threshold - maybe 250 or 500 - at which point we'll force pagination. @boonebgorges So what's left here? Needs a new patch? Introduces a couple of new helper functions. wp_get_top_level_comments_count( $post_id ) does what it says. wp_get_comment_pages_count( $post_id ) gets the *canonical* comment-page count for a given post. By "canonical" I mean the count that is actually used when WP how to build comment pages (in comment_template()). This means that it respects threading as well as comments_per_page. It also doesn't require full comment objects. In these ways, it differs from the existing get_comment_pages_count(). When page_comments is disabled, and the comment count for a post is above the (filterable) 'comment_paging_threshold', comment pagination is forced, with 'comment_paging_threshold' used as the per-page value. After some discussion, and lots of teenage angst, I've decided to revert the 'page_comments' changes. Forcing comment pagination raises lots of UX and backward compatibility issues that need to be addressed. After the revert, I'll move the latest patches to a new ticket, for consideration in a future release. not time out by processing unwieldy numbers of comments on a given pageload. appear on the default comment page. stops forcing comment pagination. While this revert is a shame :( we did actually manage to accomplish some real improvements. Comments are loaded in a much more svelte manner . And we now only load the comments required by the page, instead of loading them all and letting Walker_Comment do the pagination work; this part of  survived, and it addresses the issue that the current ticket was originally opened for. I've opened #34389 for further discussion of the performance problems that arise from setting page_comments to 0. I think we can mark the current ticket as fixed. Omit cpage query var in comment link if comment pagination is disabled. Ensure that non-default pagination values work in wp_list_comments(). wp_list_comments() that do not match the corresponding global query vars. custom pagination parameters. See #8071.
passing them to the comment walker for pagination, as was the case before 4.4.